We're more than just a cafe — we're family. Our craft soups are made with only the freshest, natural ingredients. We offer more than 20 delicious recipes throughout the season. Join us May through October for family-friendly free concerts. Folky Friday - Enjoy some of the best local & regional Folk, Americana, Bluegrass & Singer-Songwriters around. Starting May 3rd. 6:30pm - 8:30pm. Back Yard Brunch - Sunday Funday! Get your brunch on with some smooth Jazz, Oldies, Swing, Steampunk, R&B & Soul. Starting May 5th, 11am - 2pm. BUON APPETITO - Fontina, Mozzarella, Provolone & Parmesan melted to a perfect gooey goodness, with house made sun dried tomato pesto, on a toasted ciabatta roll - $8.95 Add Pepperoni - $9.95. 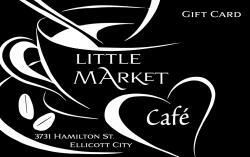 Give the gift of Little Market Cafe! Pick up a gift card on your next visit.